A Tale of Two Soldiers: Carter v Manning. Today Staff Sergeant Ty Michael Carter was told he would receive the United States Medal of Honor for gallantry and heroism. 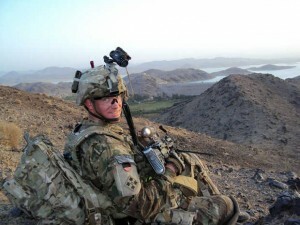 In the course of the 12-hour fight in northeast Afghanistan, enemy fighters would breach the wire of Combat Outpost Keating. Twenty five of the 54 U.S. soldiers in the battle survived wounds. Eight others lost their lives. The enemy hit just before 6 a.m. Their machine gunfire and rocket propelled grenades seemed to rain down on the outpost. “All you could do was dig in and save your brother,” he said. The soldier he pulled to cover, Spc. Stephen Mace, made it through the day but later died of his wounds. Carter said he is comforted knowing that Mace received his last rites and died knowing his fellow soldiers were getting him to safety. The horrible battle for Outpost Keating was chronicled in Jake Tapper’s recent book, “The Outpost.” Sergeant Carter is the second soldier from that day’s battle to receive the Medal of Honor. 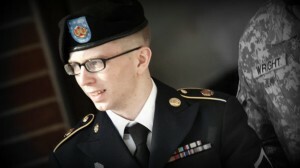 In other news today, Bradley Manning, the Army soldier who gave away American national security secrets to our enemies via Wiki Leaks, was found guilty of several espionage charges against him, but acquitted of the most serious charge of aiding the enemy. Manning, who’s gay, said he’d done it to protest the Don’t Ask, Don’t Tell policies of the military. Earlier this year he admitted to sending hundreds of thousands of diplomatic cables, war reports from Afghanistan and Iraq and other files to WikiLeaks while working as an intelligence analyst in Baghdad. In doing so, he pleaded guilty to ten of the charges against him and faced up to 20 years in prison. He has now been found guilty of the bulk of the remaining charges, which could see him spend the rest of his life behind bars. At his plea hearing in February, Mr Manning tried to explain why he had exposed American secrets. He hoped to “spark a domestic debate of the role of the military and foreign policy in general” and “cause society to reevaluate the need and even desire to engage in counterterrorism and counterinsurgency operations that ignore their effect on people who live in that environment every day.” One of his earliest publicised leaks, that of the so-called“collateral murder” video, certainly had the desired effect. Lending credibility to his claim of whistleblowing, other leaked documents exposed acts of abuse and illegality. One man fought for country and brotherhood. Another hurt his country for personal reasons without respect to the brotherhood. Whom would you rather have on your team? Sergeant Carter’s worst moment is better than Manning’s most shining and glorious one. May the turncoat have an uncomfortable 20 plus years in hell.